Our world is in turmoil … unstable … full of pressures and uncertainties. And sometimes the problems can seem so overwhelming we wonder if there are any answers to the needs, to the troubles, to the tribulations we face. But there is an answer. And that answer is found in prayer. In fact, God is looking for people like you and me who will so connect with Him in prayer, that He can unleash His power through us. It is a power to overcome any trial, any difficulty, and any challenge. It’s a power that can change our world! When we learn to pray the kingdom way there are amazing results. When we connect with God in prayer we are given His very presence and power for living. That’s you and me! He continually, consistently, fervently, and faithfully prays for you and me. Jesus, the very Son of God, is and was a Man of prayer. In fact, there are ten prayers given by Jesus that are recorded in Scripture…prayers He prayed throughout His life and ministry. He prayed at His baptism. He prayed in the desert during times of temptation. He prayed early in the morning. He prayed before He chose His disciples. He prayed in the Garden of Gethsemane. He prayed at the cross. Jesus’ life was a life of prayer. Is there any wonder that His disciples, His most intimate followers who observed this magnificent life of prayer, asked, “Lord, teach us to pray.” (Luke 11:1)? Now, it’s impossible to understand everything there is to know about prayer. It will take an eternity for us to uncover and discover the full impact and power of prayer in our lives. But while we are here on this earth, we need to learn to pray. We need to develop our prayer lives so that we can unleash the power of prayer. Ask, and it will be given you; seek, and you will find; knock, and it will be opened to you. For everyone who asks receives, and the one who seeks finds, and to the one who knocks it will be opened. Jesus invites you to this amazing adventure of unleashing the power of prayer in your life. So often the books we read and the messages we hear regarding prayer put us on a deep guilt trip. And rightfully so, because most of us struggle with our personal prayer lives! But beyond the guilt, we need to understand the great joy and privilege prayer really is. We need to grasp the exciting, enriching experience of prayer. We need to understand what God does when His people pray. We need to understand the power that is unleashed in prayer. Jesus offers an invitation to prayer to everyone…not simply to the super saints or the spiritually elite…but to every follower of Jesus. Every child of the Father is welcomed into His presence. He invites us to ask … to seek … and to knock. 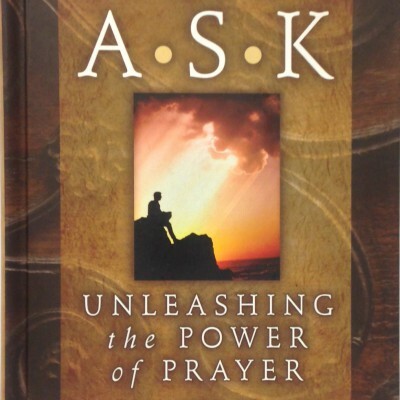 Excerpted from Ask: Unleashing the Power of Prayer by Dr. Jack Graham. Copyright © 2006, All rights reserved. Used by Permission of PowerPoint Ministries.